Be a planner but believe in magic too! Channel the purity, strength and goodness of everyone's favorite mythical being all year long... even the most mystical creatures need to keep track of their appointments! 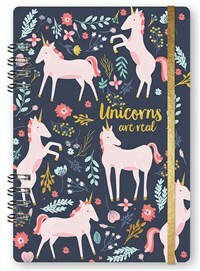 This planner features an inside pocket, two pages of stickers, spiral binding, binder band and tabs.